In 2001, Rob proposed that the Log Homes Council establish a Heritage Grant to support non-profit enterprises that are restoring log buildings for the benefit of the public to enjoy this part of our national history. The Grant was first given to Explore Park near Roanoke, VA. They were deconstructing log structures from around the area and reconstructing them at the Park. Continuing the interest in honoring our heritage of log building, this page offers a look at the role of log structures in our history. These are truly living American treasures that demonstrate the durability of log homes, even when “TLC” was not applied until the restoration. 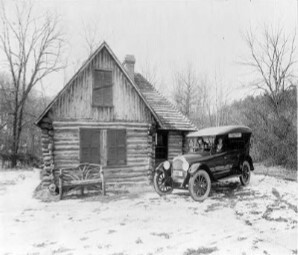 Others show a slice of history and service that is a source a pride for the log home industry. Contributions to this page are welcomed. Go to Contact Us to tell us your story. significant log building history is available through the National Park Service. Below are three references to log building in our national parks and more. A Different View Of Homes In D.C. The photo below is circa 1920. Picture made for Oldsmobile Sales Co.
For an excellent historic summary and information on care and restoration of log buildings, visit the Henry Ford site here.